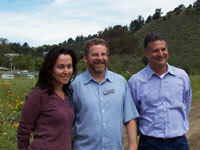 The 5th Annual Cooking for Solutions event was a lifetime packed into a two day event in Monterey California. The event supports Monterey Bay Aquarium’s Seafood Watch program, which aims to connect individual buying decision with the health of oceans and the soil. Seafood Watch has partnered with zoos, aquariums, conservations organizations, retailers, restaurateurs and seafood purveyors to shift seafood markets in directions that reward sustainability. On May 18th a one-day educational seminar at the Aquarium offered highlight speakers who gave information on sustainable food and wine, sharing on topics of burning issues, hot topics and compelling stories. Panels of professionals like Nell Newman of Newmans Own Organics and celebrity chefs provided valuable information on sourcing sustainable foods. A “Meet the Chefs” reception providing recognition to chefs was a great beginning for Cooking for Solutions 2006, where Rick Bayless and celebrity chef ambassadors received recognition. 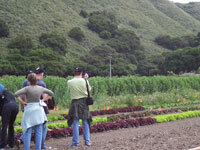 On May 19th there was a delightful visit to Earthbound Farm in Carmel Valley, where guests were given a tour and vast amounts of information on organic farming. Following the farm tour we were treated to an outstanding organic lunch that included Earthbound grown fruits and vegetables, along with additional organic products and wines. The perfect ending to our gourmet organic lunch was delicious carrot cupcakes with cream cheese frosting. This luncheon in the garden was a feast not easily forgotten, and the hospitality of the owners Drew and Myra Goodman was only surpassed by that of the drivers from the Carol Chorbajian’s CCM&E transport who graciously drove all the foodies to and from the many Cooking for Solutions locations. Our hosts, the Goodman’s, explained that following college they started with a small farm where they grew raspberries and sold them at a farm stand for profit. That was twenty-two years ago, and today this farm is a major supplier of organic lettuce throughout the United States. They grow every variety of fruit and vegetable, along with organic flowers and herbs. Their mission is to educate people on the importance of good health through organic living, and it is obvious they are accomplishing what they intended to do. The farm has an online store where products can be ordered, and they also have an organic kids section for healthy little people. The Earthbound Farm has a large store where their produce and other fine organic products are sold. There is an organic kitchen that prepares deli foods to go, along with soft drinks, juices and a variety of health snacks. Fresh organic flowers are sold from a charming cart at the entrance to the store, and a beautiful walking garden can be perused by visitors. The couple has recently released a line of their own fresh juice products, and continue to develop new ideas for customer enjoyment. It was a fun and delicious afternoon on the farm. We then went on a Seafood Tour at the Monterey commercial wharf that included a visit to the Monterey Bay Abalone Company, where we were given information on how to select fresh seafood and how to choose sustainable seafood. The Cooking Solutions Gala at the Monterey Bay Aquarium that evening was nothing short of spectacular. 40 restaurants offered gourmet tastes of their dishes prepared with sustainable ingredients, organic food and wine was everywhere, including 35 wineries pouring sustainable and organic wines. Celebrity chefs prepared featured seafood dishes and served them from stations throughout the Aquarium. Honored chef Rick Bayless shared cooking tips and signed his latest cookbook for guests. Each guest was given a souvenir wine glass and a package of take-home recipes from the 40 chefs. Over 1,500 guests enjoyed this unique event of eating and drinking to the music of a variety of area bands and musical groups. 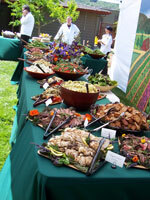 I have attended many food extravaganza events, but this was so successful. Congratulations to everyone from Cooking for Solutions, and especially to Ken Peterson of the MBA and the staff for an unforgettable evening. On May 20th the morning session at the Aquarium was filled with great chefs and great recipe ideas as celebrity chefs Nancy Oaks, from the Boulevard in San Francisco; Louis Osteen from Louis’s at Pawleys in South Caroline and Jerry Traunfeld from The Herbfarm in Washington demonstrated ways to prepare sustainable seafood and other dishes. This was a special opportunity for attendees to ask questions, and get a sense of the talent and personalities of three of ourrenowned culinary stars. Chef Osteen’s crab cakes were fabulous, and the information he shared on the shortage of crab due to over crabbing in Louisiana was shocking. According to the chef, a majority of the crabs they are using there come from Maine. Nancy Oaks is a consummate pro in the kitchen, and kept everyone laughing with stories about her “sausage king” husband, as she prepared a tempting cold entrée, and chef Traunfeld, a leading expert on herbs, discussed the advantages of using fresh herbs in your cooking, not only for good taste, but also for good health. The Cooking for Solutions 2006 was my first introduction to this event, to the Monterey Plaza Hotel, to the importance of supporting sustainable programs, to the energy of the Monterey Bay Aquarium and the City of Monterey. I simply love this historic city by the sea, and the people are delightful. I look forward to returning again soon to delve into the past and present of this refreshing and restorative bay area. For 2007 event information visit www.cookingforsolutions.com.